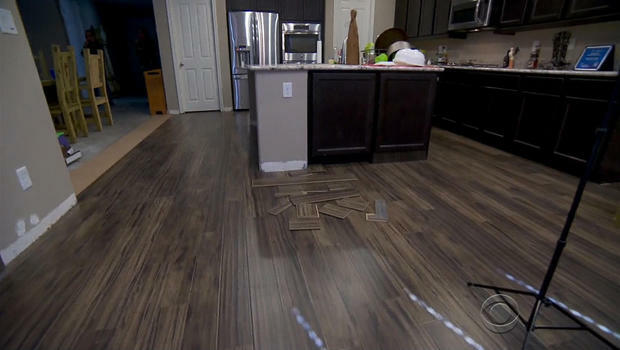 The “60 Minutes” report that found high levels of cancer-causing formaldehyde in flooring sold by Lumber Liquidators brought a call on Capitol Hill Wednesday for a federal investigation. Understandably, homeowners whose families walk on that flooring every day want to know what they should do. In Las Vegas, environmental consultant Steve Havens used formaldehyde monitors in a home with newly installed Lumber Liquidators flooring manufactured in China. The test will cost about $600. Homeowner Noah Bennett said it’s worth it. Laminate flooring sold by Lumber Liquidators is installed in a home under construction Wednesday, March 4, 215, in Las Vegas, Nevada. “If it’s not safe, we’ll be ripping it out of the house and seeking whatever action that Lumber Liquidators can help us with replacing the flooring,” Bennett said.